Standing out in a crowd — and particularly, the crowded world of social media — may become a little easier as MIT researchers develop a clever way to tweak profile photos to play up a person’s most memorable facial features. 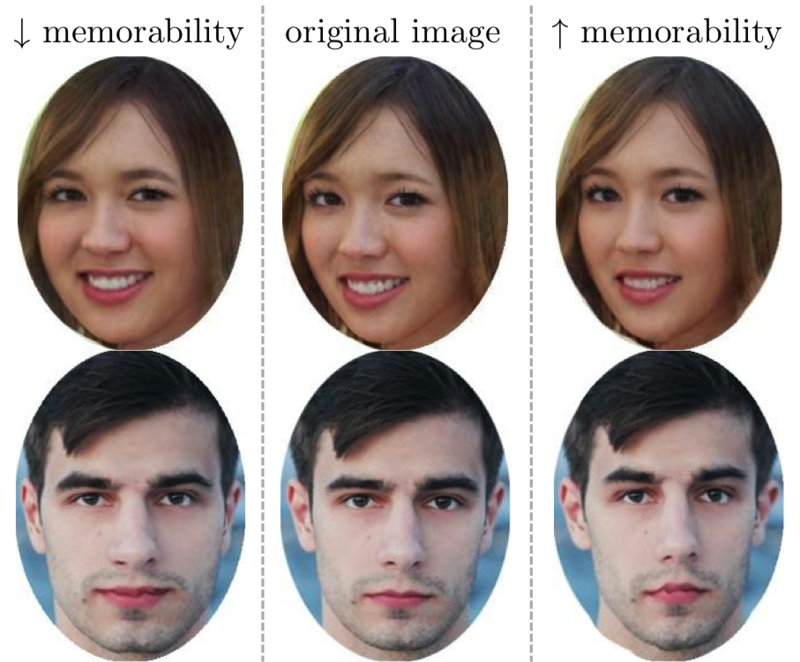 Aditya Khosla and others at MIT have found a way to make photographs of faces more memorable or more forgettable, opening new doors in the understanding of memory. The process was detailed in work presented at the International Conference on Computer Vision in Sydney in December 2013 and earned Khosla a Facebook Graduate Fellowship for further research. According to the researchers, such “feature tuning” — which could be extended from memorability to other qualities, like confidence or trustworthiness — has the potential to change everything from one’s profile photo on Facebook to online dating to political campaigns and advertising strategies. In Khosla’s first few weeks as a graduate student at MIT, the talk on campus was about a recently published paper that brought psychology together with machine learning — training a computer to identify patterns in data. Aude Oliva, a researcher with MIT’s computer vision and graphics group, explored what makes images memorable and came to an unlikely conclusion. The photos that ranked highest on memorability didn’t have greater beauty, a bigger smile, a special gleam in the eye or a certain shape of the jaw. Rather, the computer was picking up on a multitude of tiny details and quirks that contributed to memorability but would be impossible to find and define on their own. There were no big distinct trends — instead, a thousand tiny tweaks, statistically tied to the memorability of the photos in the study. “By and large, these sorts of approaches don’t give you explanatory power — they give you a result,” says Hager. “So you get an algorithm which might perform quite well, but you can’t articulate necessarily why it does that. It’s basically a black box that goes from measurements to output.” Knowing that something is measurable is the first step; after that, it’s possible to train a computer to look for it and put it to work. The team’s program first makes a chain of small, random changes to a photo, creating a slew of photos with only slight differences from the original. It gives each new image a score, detracting points if the changes affect attributes like emotion or attractiveness or if the face begins to look different from the original; it awards points if the photograph becomes more memorable. Meticulously measuring 10,000 randomly-changed versions, the program pinpoints the highest scorer: a more memorable face that still looks like the subject. Then it starts the process again and alters that picture, slowly building up to the best possible modifications. It can also go the other way — toward a less memorable photograph. As Khosla worked with the algorithm, he tried tuning other attributes besides memorability — the algorithm could just as easily tune things like attractiveness and friendliness, and it was easier to see at a glance if it was working. The results are the first of their kind. Hager, the computer vision researcher, says that while the data collection process was similar to other machine learning work, combining that algorithm with an optimization process is new. Algorithm in hand, Khosla will soon turn his sights to tuning other, more complicated features of a photo using the same type of data gathered from online surveys. Then the possibilities are endless, he says. According to Adam Glenn, a journalist and digital media consultant, this kind of feature tuning — while technically impressive — fits with the way people currently use social media. He’s quick to add that there are more meaningful uses for the memory research as well. Researchers might develop a model tailored to help people who are unable to recognize faces, for instance, or educators could make more memorable charts and infographics for easier learning. Oliva’s group has already published an analysis of what makes infographics memorable and what parts of them people store in memory, as well as looking into the memorability of particular words. Khosla is confident that the technology will be useable by the mainstream soon – his next goal is to cut down on the time the algorithm takes and to reduce errors and artifacts introduced in the process. He says smoothing out the process only a matter of tinkering. Then and only then will it reach its final and inevitable form: the smartphone app.